Now that there’s just two of us at home, I’ll have to learn to cook all over again. I’m used to cooking for four, which means if I’m not careful, our fridge gets full of leftovers that can take days to finish. Freezing leftovers is a good option, but not everything freezes well. And I’d rather make smaller amounts so we have some variety, rather than pulling out increasingly smaller containers of yesterday’s (or the day before’s) dinner. Maybe it was the “for two” that appealed to me about this recipe. Or maybe it was the great flavours – asparagus, pancetta, parmesan – all wrapped together in one dish. 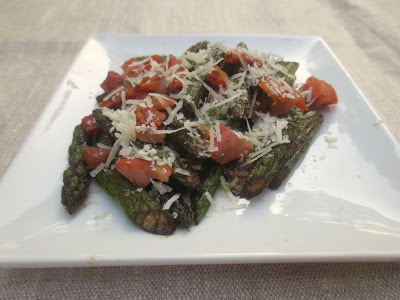 Whatever it was, this asparagus side dish was a real winner. So good, in fact, that it made me long for leftovers. Slice the asparagus on a sharp angle into pieces that are 2 inches long. In a medium (9-10 inch) nonstick skillet, heat the olive oil and 1/2 Tbsp butter over medium-low heat. When the butter has melted, add pancetta and cook until crisp, 3 to 5 minutes. Remove the pan from heat and transfer pancetta with a slotted spoon to a paper towel-lined plate. Add asparagus to the skillet, season with salt, and return pan to the heat, raising it to medium-high. Cook stirring frequently, until all of the asparagus pieces are nicely browned, up to 10 minutes. They will still be firm, but not crunchy. Remove pan from the heat and add remaining 1/2 Tbsp butter and the balsamic vinegar (it will sizzle). Stir right away and keep stirring until butter has melted. Transfer asparagus to a serving dish and garnish with Parmigiano and pancetta crisps. Looks delicious. We just don't get good asparagus in the off season here. Saving this one for Spring. If you come up with good "for two" recipes let me know. For us it works out okay, we both take our lunches, so that's where the leftovers go. Have a great week. Looks delicious. I'm excited you're making recipes for two since I'm cooking for one. Pancetta makes everything better!! Cooking for two is harder than people think! 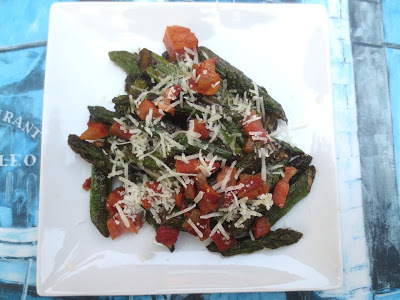 Sauteed Asparagus with Pancetta and Parmigiano… it sound so delicious! I can't cook for just 2 though… well… you could call it cooking for two, freezing 3/4 for later! Asparagus is a favorite of mine and pancetta makes it even more delicious! I'm not a very healthy eater–green stuff doesn't draw me in. But if I did like green stuff, this would be awesome! This sounds delicious, I'm sure it won't take you long to get cooking for two! It sounds delicious! I remember how hard it was to cook for 2 when the boys went away to college and on after that, and still cook too much sometimes. Thanks for the recipe! So simple and so good. Sounds like a real winner. I love leftovers but I totally agree about not going overboard so you can have variety. And since we love to cook/bake, smaller servings make sense. This does sound delicious, Beth! I must have missed visiting here longer than I thought…to find out you are empty nesters!?! What?!? Even though it's always been two of us, I've never really learned how to cook for two — always making too much. On purpose, though, because we like to freeze leftovers. Although I've gotten much better at it recently. So this is a dish that's perfect for us — loads of flavor, and just the right quantity! Thanks so much. This is simple to prepare and lots of flavour. I will easily finish the whole portion. My mom had the same problem when my brother and I left home. She still cannot compromise with that idea and her fridge is always as full as mine haha! I love the flavors in this dish Beth! I do a lot of cooking for four and then we eat a lot of leftovers! But it is more fun to have variety. This looks so tasty and healthy! I think there's a cookbook out about cooking for two. I cook for one! Not easy, but I've managed without too much waste. Love your dish, Beth. Asparagus is a favorite. Yes, cooking for smaller numbers is a struggle. This dish sound superb – I adore asparagus. Hi Beth, I have been cooking for 2 the last 5 years or so and still have a hard time getting the portions right. Love the flavors of this dish, all my favorites. Yes, I am going through that same transition now. The best thing I did was buy some smaller baking dishes–6 inch pie pan (Crate & Barrel), 6 inch spring form pan, etc. Pie for two! Your dish sounds fantastic–lots of my favorite ingredients! Love the combination of ingredients. I found some asparagus that was amazingly good for October last week. (Wonder where it came from? Best not to wonder?) When my eldest went to college, I couldn't master cooking for three. And while I have figured out cooking for two – I just make more and leftovers are for lunch and a future meal, Empty nesting – a little bittersweet.